Pins and needles is an annoying feeling that most people recognize, but sometimes it happens so often or for so long that it is actually a constant sensation. When this happens, it can interrupt your life. Knowing what causes the problem and how to manage it can make a big difference, so keep reading to learn more. Everybody experiences some amount of tingling in their extremities some of the time when a limb “falls asleep” because it has been in an odd position or experienced pressure for a long time. However, constant tingling is a long-lasting condition that can cause some annoyance and distress because it does not disappear. It can recede for periods of time, but it will return without obvious cause. It is generally localized in the same place when it occurs and lasts for long periods of time. Estrogen is one of the most important hormones in the body. While most people associate it only with menstruation, it is actually integral to women's health in many ways. 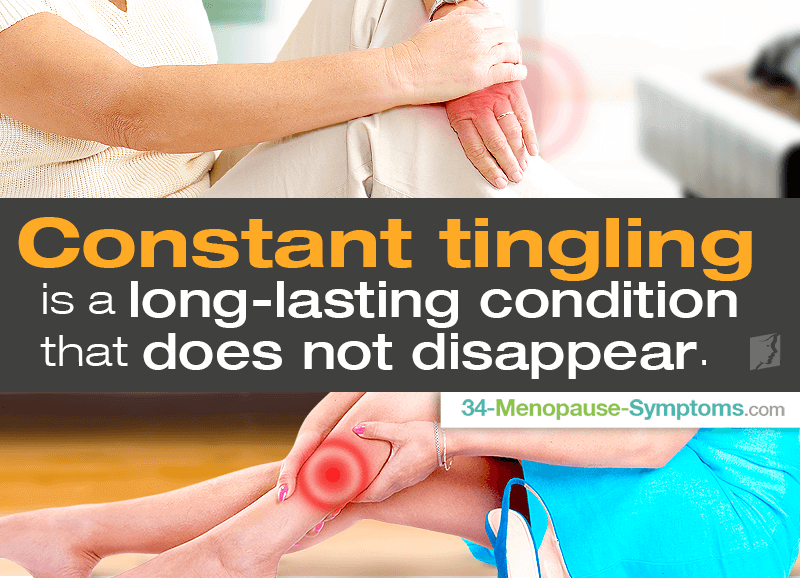 Lower levels of estrogen, such as those that occur during and after menopause, have been linked to increased likelihood of tingling in the extremities. This means that for many menopausal women, tingling in legs, feet, or hands is likely to be a result of a hormonal imbalance. Hypothyroidism - when the thyroid gland produces too little of the thyroid hormone - has been shown to influence nerves in the body and cause a sensation of tingling. While the connection between hyperthyroidism and nerve damage is not completely understood, it is most likely to cause tingling in hands and feet. While diabetes is mostly known for the blood sugar ups and downs it can cause, it is also the cause for a number of other conditions, including pain and tingling in feet and hands. This is because the blood sugar fluctuations caused by diabetes can actually damage nerves over a long period of time if blood sugar is not properly controlled, and the damage causes tingling. This disease is fairly rare, but may be the cause of constant tingling. It is a syndrome that affects the blood vessels, most often in the hands and feet, causing the vessels to narrow if you are cold or stressed. This makes it difficult for blood to reach the hands and feet, and may result in a tingling sensation. For many cases of constant tingling, it may be necessary to consult a doctor for the right medications or other treatments. Because constant tingling is most often a symptom of something more serious, it is not recommended to devise your own treatment plan without a doctor's advice. If your tingling is mild, a doctor may instruct you to make a few minor lifestyle changes, such as getting more exercise or sleeping more at night. These changes can help improve symptoms of some types of tingling. With knowledge of the causes of this condition, as well as some information about solutions, it can be easier to manage constant tingling. To learn more about treating tingling, read about 5 fruits and vegetables to improve circulation and reduce tingling sensations.